Pipa can mean several things. First of all it is a contemporary Chinese string instrument (chordophone). This pipa is a lute with four strings that are usually tuned as sol (A2), dol (D3), re (E3), and sol (A3), a bent neck, a pear-shaped wooden resonator, and thirty frets, producing a pitch range of about four octaves. But the Chinese term pipa also refers to the back and forth hand and finger movements of pipaists as they play the instrument. 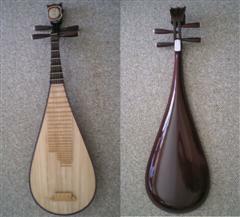 Pipa can thus be broadly defined as any Chinese plucked lute. Pipaists hold their instruments somewhat vertically, and strum the strings with right hand movements towards or away from their torsos. They stop and pluck the strings to produce specific pitches or tones by pressing on certain frets with the fingers of the left hand. Pipa performance techniques are part of a developed tradition and have specific names. Two very common techniques are the tremolo (lun), which involves the plucking and sounding of a pipa string with a rapid rotation of the fingers of the performer’s right hand, and plucking (tan),a simple pulling of a pipa string towards the torso of the performer. Pipa can also mean a piece of pipa music that is being performed and experienced, or the notated score of a pipa composition. Most contemporary audiences tend to ignore the critical differences among these three musical things. It is particularly common to approach music as something that can be equated with and examined through its notation. Illustration 3: The first page of Lin Shicheng’s notation for “Ambushed from Ten Sides” shows the beginning of the piece: its title, subtitles, pitches, rhythms, and dynamics. 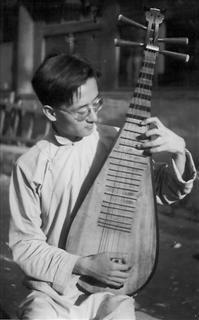 Music example 1: Li Shicheng performs “Ambushed from Ten Sides”. In its notated form the piece has appeared in a number of anthologies, in versions ranging from nearly identical to significantly different. Music example 2: Liu Dehai performs “Ambushed from Ten Sides.” The piece “Ambushed from Ten Sides” (“Shimian maifu”) can thus be considered objectively as a masterpiece of pipa music, a composition that tells through a programmatic title and a string of subtitles the story of the demise of Xiang Yu (232BCE -202BC). One can also objectify the melodies and rhythms of a piece of music as the sonic objects that musical notation represents. Click HERE to understand this artifact’s GENRE.